Arrow Video has announced the UK Blu-ray release of Wes Craven's The People Under the Stairs. This Blu-ray disc will be available to own in the UK on 4th November and include packaging which will showcase the original poster artwork as well as a reversible sleeve with newly illustrated artwork. Wes Craven, the master of terror who brought you the infamous The Last House on the Left, invites you inside another house of horror. The People Under the Stairs sees director Wes Craven return to one of his trademark themes: the savagery which lurks just underneath the skin of the outwardly conventional family unit. Often overlooked in favour of the director's more A-list hits such as Scream and A Nightmare on Elm Street, The People Under the Stairs is a superior slice of home-bound horror which can stand proudly alongside Craven's best works. "As a huge Wes Craven fan, it was a dream come true to be able to work on the first ever Blu-ray release of The People Under the Stairs. Released in 1991, a few years before Wes Craven's name would become synonymous with the Scream franchise, The People Under the Stairs is one film in the director's resume which all but passed me by first time around: a fact which has made revisiting this movie all the more of a revelation. The People Under the Stairs is a real gem of early 90s horror which weaves gruesome visuals and pitch black comedy into a grim fairy tale for the ages – and with our new Blu-ray release, Craven fans get to see the film looking better than ever before! I was especially pleased that we were able to include on the disc an insightful interview with the great director himself, alongside engaging interviews with stars Sean Whalen ("Roach") and A.J. Langer ("Alice"). Rounded off with some suitably grisly new cover art from the inimitable Stephen R. Bissette, this package represents the perfect Halloween treat!" 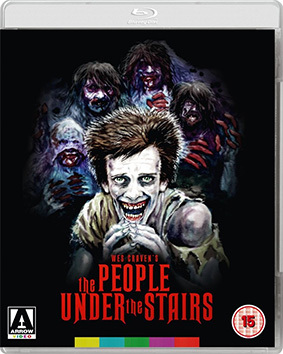 The People Under the Stairs will be released on UK Blu-ray on 4th November 2013 by Arrow Video at the RRP of £19.99.